The Australian ODI squad for the upcoming three-match series against India has been picked during lunch on day 2 of the fourth and final Test between India and Australia at the SCG. The 14-member squad has quite a few surprises as the selectors have recalled off-spinner Nathan Lyon, batsman Usman Khawaja and veteran pacer Peter Siddle for the ODI series and have decided to leave out Chris Lynn, Travis Head, D'Arcy Short, Ben McDermott, Nathan Coulter-Nile and the Australian pace trio in Tests, Mitchell Starc, Josh Hazlewood and Pat Cummins. While the Aussie pace trio in Tests has been rested keeping the future assignments in mind, the likes of Lynn, Head, Short and McDermott have been dropped from the side. Coulter-Nile, who was Australia's best batsman, yes, in their last ODI assignment, which was against South Africa before the commencement of India's tour of Australia, has been given a rest as he is recovering from a back injury. 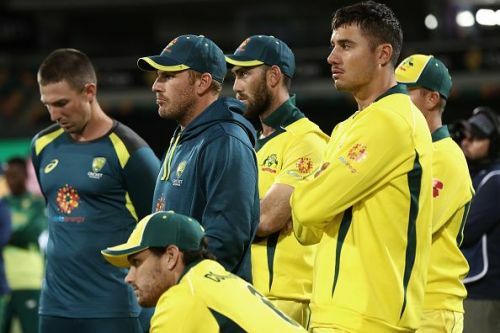 Australia's selection panel chairman Trevor Hohns said the batting revamp came after key players failed to take their opportunities. He said, "Travis Head, Darcy Short and Chris Lynn have been unlucky to miss out. All three have had opportunities to cement their spots, but unfortunately, they have not been as productive as we would have liked in recent times when playing ODI cricket for Australia. Nathan Coulter-Nile recently experienced some lower back soreness, and on the advice of our medical staff we weren’t prepared to risk selecting Nathan in the side given the demands of the upcoming ODI series." The squad led by Aaron Finch will have two vice-captains in Alex Carey and the returning Mitchell Marsh. Siddle last played an ODI for Australia in 2010 while Khawaja's last game in the format came in January 2017. The series gets underway at the SCG on January 12. Squad: Aaron Finch (c), Jason Behrendorff, Alex Carey (wk), Peter Handscomb, Usman Khawaja, Nathan Lyon, Mitch Marsh, Shaun Marsh, Glenn Maxwell, Jhye Richardson, Peter Siddle, Billy Stanlake, Marcus Stoinis, Adam Zampa.